This moving title includes additional information on Clara Luper's extraordinary life, her lessons of nonviolent resistance, and a glossary of key civil rights people and terms. Olugbemisola Rhuday-Perkovich is the author of 8th Grade Superzero, a Notable Book for a Global Society, as well as a Notable Social Studies Trade Book for Young People. She is a co-author of the NAACP Image Award nominated Two Naomis and the forthcoming Naomis Too and is the editor of The Hero Next Door, an anthology from We Need Diverse Books. A member of The Brown Bookshelf and the Advisory Board of We Need Diverse Books, Olugbemisola holds a master of arts in education and writes frequently on literacy and parenting topics. She lives with her family in New York City. Visit her online at olugbemisolabooks.com. Jade Johnson is a New Orleans–based children's illustrator and educator. She graduated from the Savannah College of Art and Design with her Bachelor of Fine Arts in Illustration. Her work has been recognized by Creative Quarterly, The Society of Illustrators, and Applied Arts. 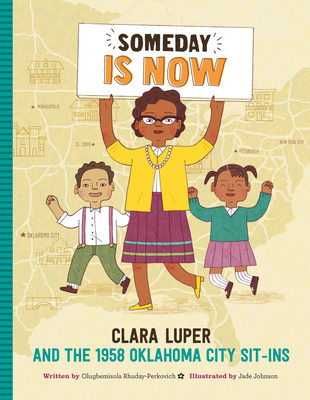 "Not only does this book highlight an important civil rights activist, it can serve as an introduction to child activism as well as the movement itself. Valuable." "Rhuday-Perkovich powerfully teaches young readers that standing up sometimes means standing out. A top addition to nonfiction collections."